Patrol Officer Alexander Gaylor (left) was named Rockland's Police Officer of the Year for 2015. Chief Bruce Boucher presented him with the award. 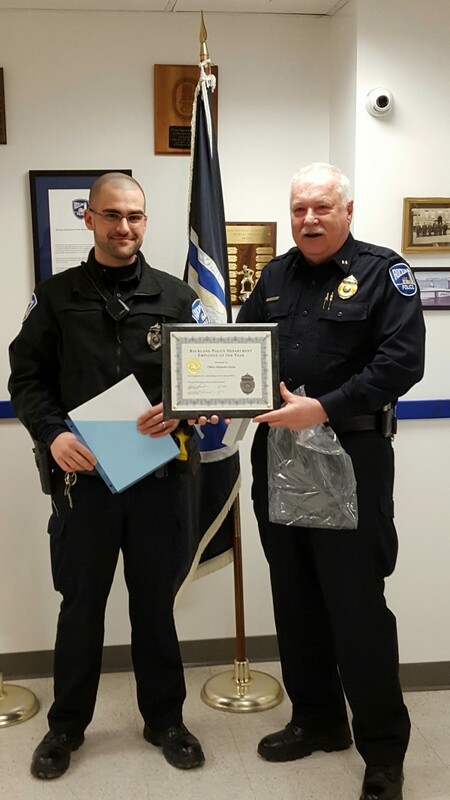 ROCKLAND, Maine — Patrol Officer Alexander Gaylor was named this week as the Police Officer/Employee of the Year for 2015. The award is based on the individual demonstrating the highest standards of professionalism and commitment to the principles of the mission of the Rockland Police Department. The nominating committee consists of the deputy chief, one supervisor, one officer and one civilian employee. Gaylor was the overwhelming choice of the committee this year. Gaylor started his career with the Rockland Police Department in April 2014. He has an associate degree in criminal justice from River Valley Community College in New Hampshire and graduated in May 2011 from the Vermont Police Academy. Before being hired in Rockland, Gaylor worked for the Brandon Vermont Police Department.